However, the vulnerabilities discovered by 20-year-old security researcher James Lee, who shared the details with The Hacker News, could allow a malicious website to perform universal cross-site scripting (UXSS) attacks against any domain visited using the vulnerable Microsoft’s web browsers. Hey Buddy!, I found this information for you: "Unpatched Zero-Days in Microsoft Edge and IE Browsers Disclosed Publicly". 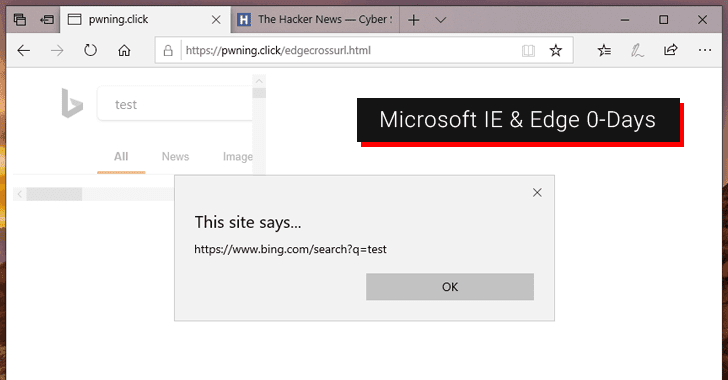 Here is the website link: https://hacknews.co/vulnerabilities/20190330/unpatched-zero-days-in-microsoft-edge-and-ie-browsers-disclosed-publicly.html. Thank you.